We Can Work with Your Ideas or Provide Our Own. Contact Us Now! 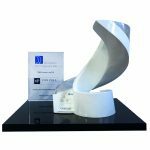 Which Material Should You Choose for Your Corporate Award? 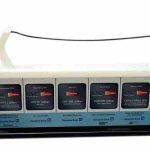 What Does 3-D Etching in Crystal Look Like? Request A Quote. We Can Work with Your Ideas or Provide Our Own . Get started now ! 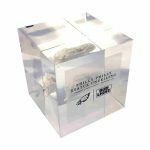 A custom Lucite embedment showcases shards of the mold used for the “Philly Philly” statue, commemorating a play truly worthy of the Super Bowl spotlight. Chiefs fans still speak reverentially of “65 Toss Power Trap”. 49ers fans, on the other hand, tend to get misty at the mention of “20 Halfback Curl, X Up”. And for Washington fans, it’s hard not to choke on the words “70 Chip”. …or maybe not. Maybe it’ll be “Philly Special”. Hard to tell. Because in the case of this particular iconic Super Bowl play, it actually had two names. By any name, it’s still the same play: the pivotal 4th-down Super Bowl LII play that had quarterback Nick Foles creeping up to the line for an apparent audible, followed instead by direct snap to running back Corey Clements, followed by a fake-reverse hand-off from Clements to tight end Trey Burton, followed by Burton’s pass to…Foles, alone in the end zone. And it’s the play that inspired a statue. 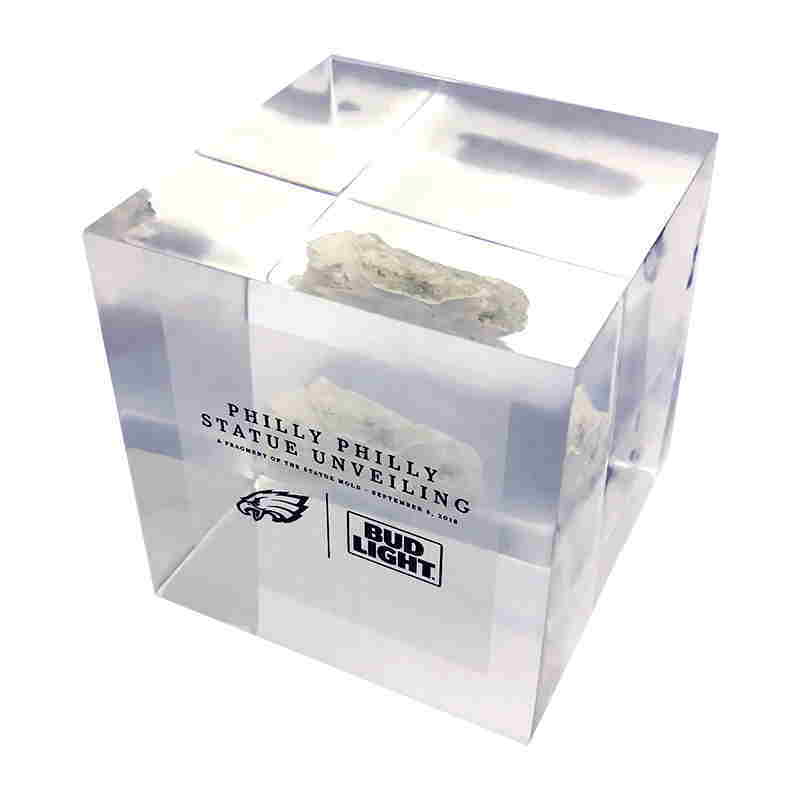 Lucite embedment incorporating a fragment of the mold used by sculptor Raymond Gibby for his 9-foot high bronze “Philly Philly” statue. Only the statue doesn’t actually depict the play; it memorializes instead the sideline exchange between Foles and Eagles coach Doug Pederson resulting in the play. And here context is everything, for it’s hard to imagine anyone commissioning a 9-foot bronze statue immortalizing an intrepid decision to kick a field goal (“Gee, I’m not sure I want to spend the entire off-season getting savaged on Twitter. What about you?”). So just to recap, this was a play that, in the words of NFL Films, “the Eagles had never called before, run on 4th down by an undrafted rookie running back pitching the football to a third-string tight end who had never attempted an NFL pass before, throwing to a backup quarterback who had never caught an NFL (or college) pass before…on the biggest stage for football”. Created by Utah-based sculptor, and commissioned by Bud Light, the statue will be on display at Lincoln Financial Field for at least the 2019 season. At Prestige Custom Awards, we have been helping clients recognize success for almost forty years, but we were especially honored to have been selected to commemorate the unveiling of the “Philly Philly” statue at Lincoln Financial Field before the Eagles home opener this season. We congratulate the recipients of the Lucite embedment piece we designed and produced incorporating fragments of the original mold used by Utah sculptor Raymond Gibby. 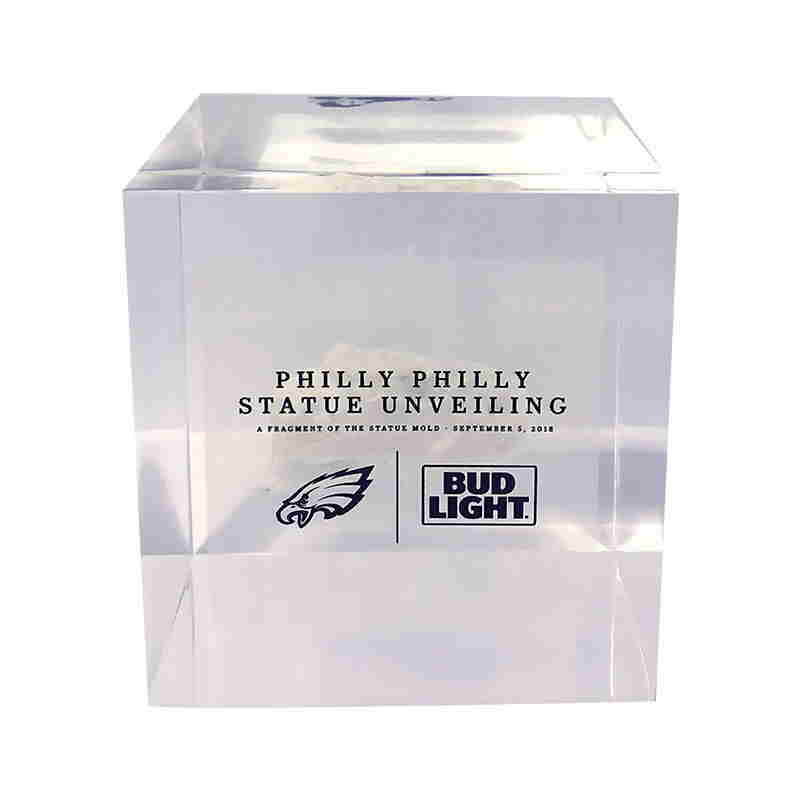 We also extend our congratulations to Bud Light, which commissioned the statue, and, of course, the entire Eagles organization.